Presenting Shakespearean heritage, Shoreditch creativity and City glamour all in one will be this magnificent, mixed-use development. The Stage is set to redefine Prime property in the flourishing East London market and provide a whole new cultural landscape, comparable to the likes of Downtown Manhattan. Designed by ground-breaking architects Perkins+Will, The Stage’s striking residential tower will span 37 storeys and comprise 412 apartments that will encircle a central public piazza – anticipated to be one of the largest in London – which will house retail, leisure and office units, along with the remains of Shakespeare’s Curtain Theatre in an all-new heritage centre. From chic studios and one, two and three bedroom apartments, to luxurious four bedroom duplex penthouses, each property at The Stage will exude five-star style. Residents will enter through a double-height reception foyer, with handpicked interiors by A-list designer Nicola Fontanella that will set the scene for refined living whilst echoing the fashion-frenzied flavour of Shoreditch. Lifestyle facilities will include a 24-hour concierge and access to a screening room, games lounge and 32nd level terrace. 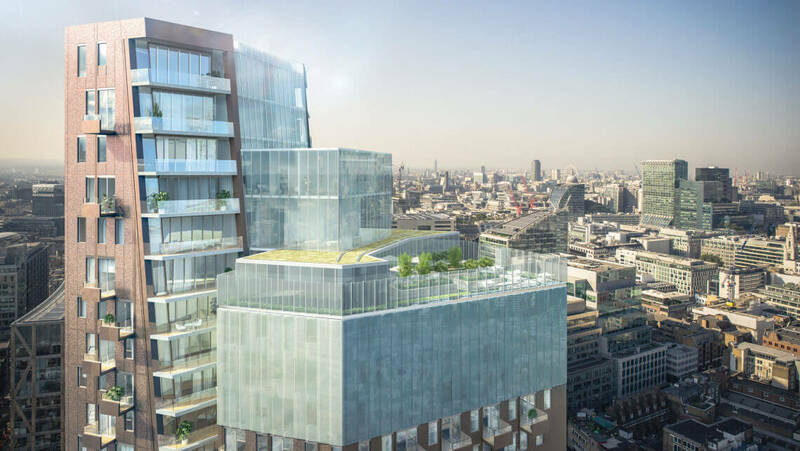 Situated adjacent to the new Amazon headquarters, just minutes from the City of London, The Stage will occupy one of the capital’s most sought-after Zone 1 locations. Shoreditch is the crown jewel of London’s EC2 with an infectious ambience that leaves Londoners constantly coming back for more. Located in the London Borough of Hackney, to the north of the City of London, Shoreditch is home to a quirky mix of renovated warehouses, trendy cocktail bars, gastro eateries, vintage markets and underground clubs. Monday to Friday, 9am – 6pm, and Saturdays 10am – 5pm.